U.S. Rep. Brian Babin (R-Texas), chairman of the U.S. House Science, Space, and Technology Committee’s Subcommittee on Space, delivered the following opening statement today at the Space Subcommittee hearing, The ISS after 2024: Options and Impacts. Today’s witnesses are Mr. William Gerstenmaier, associate administrator for human exploration and operations, NASA; Dr. Mary Lynne Dittmar, executive director, Coalition for Deep Space Exploration; Mr. Eric Stallmer, president, Commercial Spaceflight Federation; and Dr. Robert Ferl, distinguished professor and director of the Interdisciplinary Center for Biotechnology Research, University of Florida. The International Space Station ranks among humanity’s highest scientific, technological, and political achievements. As an internationally built and operated orbiting laboratory, the ISS conducts critical research that helps us both on Earth and in space. As a multi-national project, this engineering marvel illustrates the power of U.S. leadership on the frontiers of exploration. However, frontiers are not static. NASA has worked hard to conquer the challenges of low-Earth orbit. We have learned how the human body reacts to the microgravity environment. We have grown food, crystalized proteins, launched satellites, and conducted scientific observations of the Earth and stars above. What was once the height of technological daring nearly two decades ago has become almost ordinary. Once such pioneering challenges are overcome, it is time to reexamine where the frontier really lies. In 2015, Congress extended ISS operations until 2024. Congress recently passed and the President just yesterday, enacted the NASA Transition Authorization Act of 2017 which requires NASA to develop a transition plan for the ISS after 2024. NASA has estimated that the ISS will cost taxpayers between three and four billion dollars annually through 2024 — roughly half of NASA’s total human spaceflight budget. A 2014 report from the NASA Inspector General calls this figure optimistic. That report also noted several hardware concerns, including the degradation of the station’s solar power arrays. 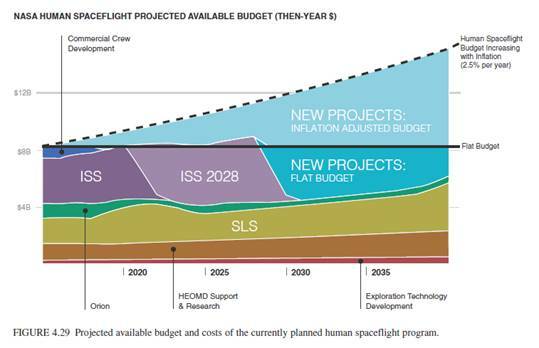 If NASA stays on the ISS beyond 2024, we ought to be aware that remaining on the ISS will come at a cost. That cost means trade-offs with other NASA priorities. Tax-dollars spent on the ISS will not be spent on destinations beyond low-Earth orbit, including the Moon and Mars. What opportunities will we miss if we maintain the status quo? In its report, Pathways to Exploration, the National Academies stated that a “continuation of flat budgets for human spaceflight is insufficient for NASA to execute any pathway to Mars and limits human spaceflight to LEO until after the end of the ISS program.” As you can see on the screen, the longer we operate the ISS, the longer it will take to get to Mars. Subsequent reports, particularly by the Planetary Society in their “Humans Orbit Mars” report, evaluated different architectures, and found that Mars exploration could be conducted with flat budgets, but that transitioning from the ISS in 2024 would be considerably better. Many private sector stakeholders currently rely on the ISS and would need to seek out other options — if they can — should the ISS be unavailable. While I believe it is in the nation’s interest to encourage a thriving economy in space, we must balance our support for private-sector efforts while also prioritizing NASA’s role as an exploration agency. Can commercial use generate sufficient revenue by 2024 to cover the full cost of U.S. participation on the ISS? Could public-private partnerships or other novel approaches allow the U.S. to continue involvement in the ISS without tying up NASA funding? Will there be a sufficiently robust market that the U.S. will be able to procure service in low Earth orbit commercially, or will the government need to continue to subsidize these activities in order to maintain access? Aside from private sector impacts, the international aspect is also a critical part of the puzzle. The European Space Agency has already shifted its focus from the ISS, changing its contribution from ISS resupply to collaborating with NASA on the Orion Crew Vehicle. Meanwhile, China will be putting their first space station into operation just as the presence of NASA (and its international partners) on the ISS could be ending, effectively turning over human presence in low-Earth orbit to China. Continuing NASA’s involvement on the ISS could arbitrarily limit or delay human exploration of deep space by the US. Let us not forget that China also plans to launch a crewed mission to the Moon in the 2030s. What we do in low-Earth orbit will dramatically influence global efforts in space exploration. I want to thank today’s witnesses for being with us, and I look forward to our discussion.